A great deal of uncertainty still surrounds the distinctive seals engraved in 1857 for Jammu and Kashmir respectively and used as franks up to 1866 before the first postage stamps. 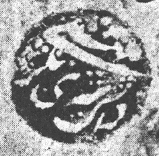 Godfrey noted that the Pandit spoke of one “set” of seals only, while the Postmaster recorded two, and he added that one of these, only, might have been used to frank letters, the other being merely used as an office seal for other purposes. ...and in dull orange-red; and that the first two illustrations are from franks in the former colour, and the third in the latter. Both are octagonal in shape and measure about 23 mm. in height by 25 mm. wide. We think it best, therefore, to begin by giving all of the size inscriptions as quoted by Godfrey. To each inscription we add a literal translation omitting, in all cases, the first three or four words ending in “Sahai” which may be roughly paraphrased as ‘by the help of God.’ The first “set” of inscriptions (Nos. 1,2) are those given by the Pandit, and the remainder as according to the Postmaster. All of these inscriptions were in Sanskrit. The use of the word Tibet is explained in Chapter XVII, page 286. Post Office Jammu Kashmir Thibet. Post Office Jammu Kashmir and Thibet. Seal Post Office Jammu and Kashmir and Thibet. 7.) MOHR DAK KHANA SRINAGAR. ...late period. This use is illustrated on Plate 2, Fig. 1 [detail above, reading DAK SRINAGAR MUNSHI], which shews one of the only two examples known to us, and the second of which is dated November, 1875. Both impressions are in black, although, at this date, all stamp-obliterations from this seal were in red, and it was not until 1878 that black superseded red for purposes of cancellation. Reverting to 1867, we note that the Postmaster recorded that, in this year, special leather bags were provided for containing the mails and that these, after being locked, were sealed with an impression from the seal which he last described. This does not imply that such a seal could not have been used for stamp-obliteration, and we know, in fact, of such a double duty having been performed by a single seal of a much later period. We are fairly at a loss to account for the rarity of the old octagonal Franks, for we have records of fewer than twenty in all, of which ten are dated. There must be in existence, at the present day, many hundreds of Circular stamps (mostly ½-Anna black) used during 1866 and 1867 from both Jammu and Srinagar; yet in the two preceding years (1864-65) we can only record a single Frank, one used in each. Such a coincidence cannot be explained by the supposition that the stamps have been treasured up by collectors, while the Franks were destroyed because they were not “stamps.” At the time when stamps of Jammu-Kashmir were being as eagerly sought for as, perhaps, those of any country, philately was in its infancy and anything even remotely resembling a stamp was at once added to the album as a matter of course. ...the assumption that they were only applied to such small portion of the mail as was of special importance or urgency. It may be possible, perhaps, to support this supposition by the evidence of the colours used for the Franks. In 1866-67 both postage-stamps and Franks were in use.The postage-stamps were obliterated in magenta at Jammu and in brick-red at Srinagar, and we have little doubt but that these colours were selected in 1866 so as to be in keeping with those of the Franks which were struck in dull purple for Jammu and in orange-red for Srinagar. But the respective colours used during 1866-67 for Franks and obliterations are not identical. In the case of Jammu, indeed, it would be impossible to confuse the bright magenta of the obliterations with the dull purple of the Franks. If both obliterations and Franks had, in fact, been struck at the same Office, we can as readily understand why the same inks might have been used for both, as we can see that it might have been considered advisable to employ inks of distinctive colours: but we can conceive no possbile reason for the employment, by the same Office, of different inks varying only more or less slightly in shades of the same colour. It may then become a question as to whether the Franks were ever struck at a Post-Office at all or may not, rather, have been the production of some special Office established for dealing with letters of special importance or value. Of the ten dated Franks known to us, two were used in 1861; one each in 1864, 1865 and 1866; four in 1867 and one as late as April 1873; The last-named dateseven years after the introduction of the postal adhesive stampsis extraordinary. The impression and envelope, however, bear numerous year-dated post-marks of British Post Offices at both “Sealkote” and Bombay, so that the correctness of the period is beyond question. It is also remarkable that at least half of these ten Franks were used after the first Circular stamps appeared. ...the Postmaster, to be correct, it may be that both sets of seals were, at first, employed for purposes other than that of stamping the mails and that the use of one set for producing the Franks commenced at a considerably later period than 1857.